As we all know, fried rice is a versatile dish. You can basically add any ingredients you want and stir-fry them together with (overnight) cooked rice in a wok. This includes the likes of egg, spring onion, frozen mixed vegetables (carrots, corns & peas), diced chicken/pork, shrimps and/or Chinese sausage. You can even add some bak kwa into your fried rice as well. Just prep the dish as usual and cut 2 or 3 slices of bak kwa with a pair of kitchen scissors into bite-sized pieces. 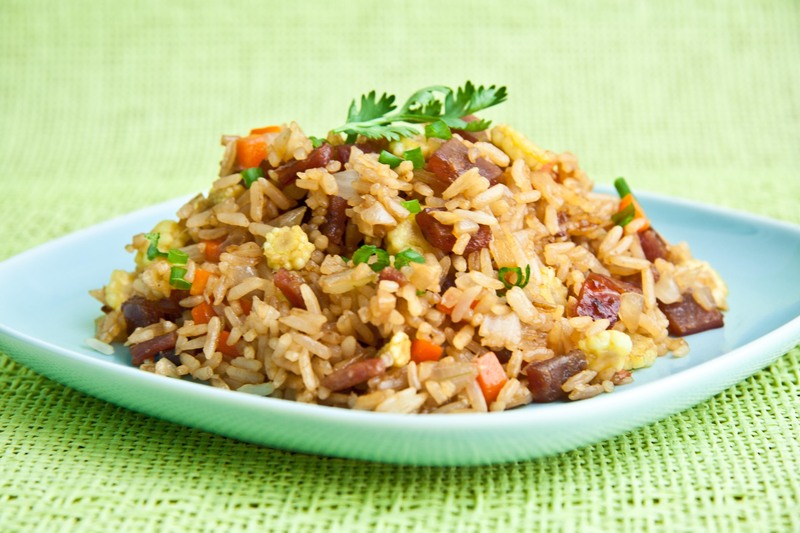 The addition of bak kwa will definitely help elevate the aromatic taste of your fried rice. Getting bored with the same old spaghetti bolognese, aglio e olio or carbonara? Why not tweak some of these classic pasta recipes with a dash of Oriental twist? That twist in question is tossing some bite-sized pieces of bak kwa. It can be any bak kwa you like such as chicken and pork. Whichever you end up choosing, the bak kwa pieces would add a subtle hint of sweetness and smoky flavour into your pasta dish. This is a classic recipe that every bak kwa lover would know. 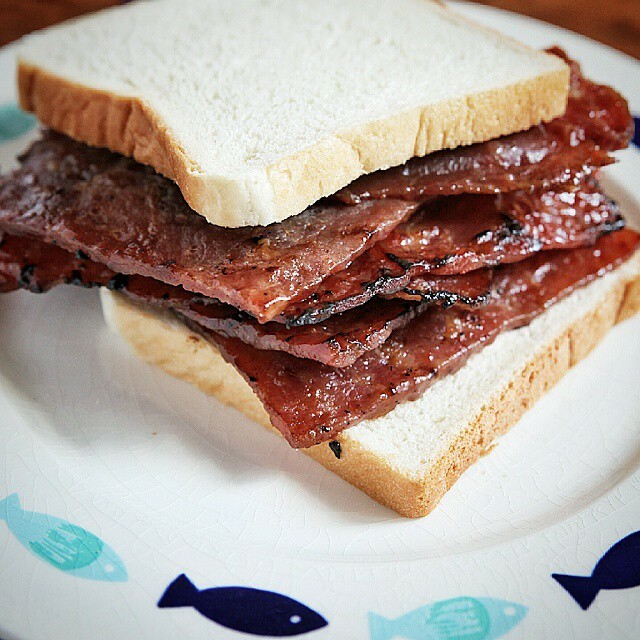 In fact, this type of sandwich is commonly available in bak kwa shops or roadside stalls. You can also easily make this at home. All you need is a slice of bak kwa (or two, if you prefer). Make sure you scissor the bak kwa piece(s) into a rectangle shape. The whole idea here is to ensure your bak kwa piece(s) would be able to fit into a hot dog bun nicely. Spread your hot dog bun with a generous amount of butter or margarine. Then, add the sliced bak kwa (pieces), followed by chicken or pork meat floss. Slice some cucumbers and add them into the bun. Finally, squeeze some chilli sauce and/or ketchup. You can even add some mayonnaise as well. Alternatively, you can also use 2 slices of regular white bread if you happen to run out of a hot dog bun. Just spread the bread with butter or margarine as usual. Add a slice of bak kwa (or more) on top, followed by other ingredients like sliced cucumbers, lettuce and meat floss. Finish it off with assorted condiments including chilli sauce, ketchup and/or mayonnaise. Or you can just skip all those extra ingredients and just sandwich a few slices of bak kwa in between as shown below. Porridge or congee is one of the most popular food staples in Chinese cuisine. You can basically enjoy a bowl (or two) anytime you want regardless of breakfast, lunch, dinner and/or even as a midnight snack. Like fried rice (see No. 1), porridge is also a versatile dish. You can add ingredients like chicken, pork, spring onions, fermented bean curd and canned fried mackerel in black beans. Note that all of these ingredients are meant to add some savoury flavour to the otherwise bland taste of white porridge. And given the fact that bak kwa has that sweet and smoky flavour, you can simply add them as toppings. Just cut them into bite-sized pieces and you’re good to go eat! 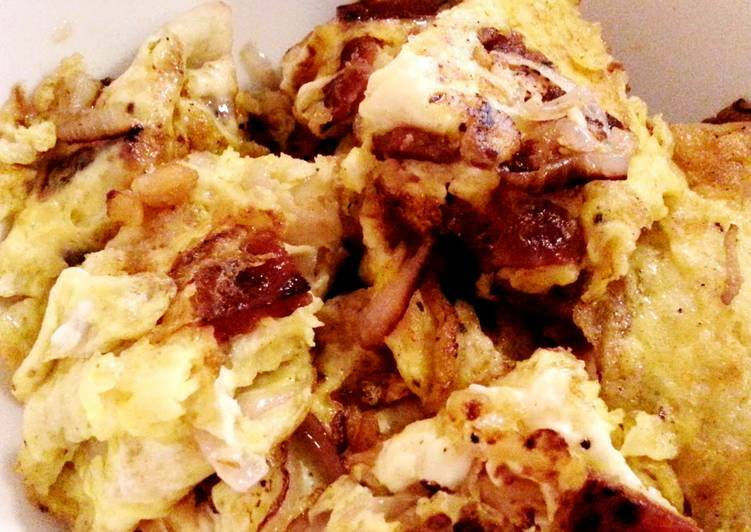 Omelette, frittata, scrambled eggs — these are some of the common eggy dishes that combine an egg mixture with different ingredients. They can be anything from sliced ham to onions and luncheon meat. Since egg dishes are typically savoury in taste, you can also add 1 or 2 pieces of bak kwa as well. You can eat the bak kwa eggy dish on its own or pair them with a bowl of steaming white rice. Pizzas are all about toppings. The more the better. Pepperoni slices, pineapple cubes, diced chicken, mushrooms, sausage, cheese, bell peppers… you name it, the choice is endless. So, why not add sliced some bak kwa into small bite-sized pieces and sprinkle them all over the pizza? Platform 1094: A Harry Potter-Inspired Cafe in Singapore!